Ruby Grapefruit, Goat Cheese and Persian Cucumber Salad. DALLAS – (June 27, 2013) –America’s emerging embrace of the tangy taste of sour foods is making headlines. On the national airwaves (American Public Media Marketplace Podcast), in foodie blogger circles and, most importantly, in high-end restaurant kitchens from coast to coast. Chefs across the country are tickling diners’ tastebuds with tart and sour accents using tangy fruits such as limes, lemons and grapefruit as well as greek yogurt and goat cheese. That’s not news to Dallas’ Chef Gorji, who has long been on the front lines of the sour and citrus revolution, having recognized the culinary importance that tartness brings to flavor, and especially, its role in his “New Mediterranean” menu featured at his intimate restaurant, Canary By Gorji, which celebrates its 10th birthday this year. “It’s really a matter of balance,” says Gorji who grew up cooking with sour fruit (Throughout his childhood, he helped his family prepare lime juice, sour grape juice and tomatoes to store in their cellar to be available for cooking during the year). But the culinary use of citrus fruit should not be labeled as trendy, says Gorji. “It is a change in how we perceive what we eat.” As reported, sour foods are really becoming more popular because of what they aren’t: sweet. People are much more health conscious today and sweet has a negative connotation with diet and health concerns. Gorji adds that diners have responded to the refreshing flavors and perceive them as healthier choices. Many of Gorji’s citrus-inspired recipes are featured in his upcoming cookbook “Zing! 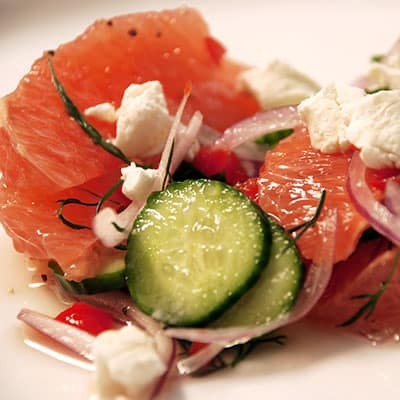 By Gorji.” His pink grapefruit and goat cheese salad featured on Fox 4 and trout with lime and barberry sauce are featured here.To get on the mailing list for an advance copy of the new cookbook, email the chef at chefgorji@canarybygorji.com. Canary By Gorji Mediterranean, Steak & Seafood offers a boutique wine selection and is open for dinner Tuesday–Thursday, 5-9:30 p.m. and Friday – Saturday, 5-10:30 p.m. 5100 Belt Line #402, Dallas, TX 75254. For more information call 972-503-7080 or visit www.chefgorji.com. Chef Gorji’s product line, Gorji Gourmet Foods™, which includes Pomodoro and Puttanesca Sauce, Dipping Oil & Marinade Primer, Pomegranate Vinaigrette and Spicy Remoulade are available for purchase at Canary by Gorji Mediterranean Steak & Seafood restaurant, DFW Whole Food Markets®, and at Jimmy’s Food Store and Royal Blue.The products are also available online at Artizone.com and www.gorjigourmetfoods.com. No Replies to "The Citrus Revolution: Lime's Time Has Come"